Shawmut can build and paint almost whatever you desire. Shipping is normally $25 unless going to the West Coast where it is $30. Examples of locomotives painted can be seen in the Portfolio page. PIKO came out with camelbacks with sound . I will reletter the Piko 2-6-0 or the 0-6-0 that come with or without sound into your favorite railroad for $125 plus shipping. You provide the engine. 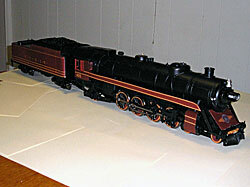 If the model is available In the past we have made modifications to Aristocraft 4-6-2 and 2-8-2. From the 4-6-2, a streamline READING G3 was made. From the 2-8-2, it has been converted into the Chessie Special 4-8-4, Timken Four Aces #1111 4-8-4, and made into a New York Ontario & Western 4-8-2. Prices start from $750 per engine which includes the engine. Each project is different, so prices may be higher. Re-letter your locomotive into a different road name $ 125 keeping the same paint scheme. Aristocraft and USAT locomotives if available will be painted in the paint scheme of your choice. Price will depend on what I had to pay for the locomotive. Green Mountain Alco RS3 painted for a MA modeler. Small locomotives like Egg liners, Mighty Mo, Lil Critter are negotiable. Norfolk Southern has a stable of heritage paint schemes applied to GE AC4400 and EMD SD70ACe’s. I have applied the paint schemes to Aristocraft Dash 9’s, MTH Dash 8’s, and am working on SD70m’s. The picture shows a PRR and READING version on a friend’s layout. SHAWMUT is currently painting for several modelers the NS heritage series locomotives. So far a PRR Dash 9, a Reading dash 9 ( customer prefers Aristocraft locomotives) and for a 1:32 MTH modeler, a PRR Dash 8, a NYC Dash 8, and a READING Dash 8 as MTH didn’t make Dash 9’s or SD70’s. I also have painted Conrail, Lehigh Valley, Jersey Central Lines (CNJ) , Norfolk & Western, Penn Central, and Southern. Cost of Heritage locomotives is $ 700 per engine plus shipping. PAINT YOUR DIESEL LOCOMOTIVE $ 300 + $25 SHIPPING. If possible I prefer locomotives with very little lettering and stripes such as PRR or UP as engines with stripes are often applied with a printable thin vinyl. We are always looking for interesting projects. In the past Shawmut made MARC commuter line 4 GP40WH diesels for their offices, recently converted 2 Lil Critters into a slug unit. After the MARC units were built using SD45 long hoods with SD70m cabs mounted on GP40 trucks, Shawmut had 6 axles trucks left over with GP40 bodies. These were converted into SD35 ( C & O and SP), N & W SD39, and a MILW SDL39 by plugging various exhaust fans and adding the or deleting the appropriate fan. The units were also configured to the particular railroad in appearance. The catalog shows these examples. 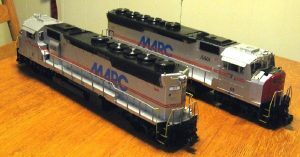 The picture at the left shows 2 of 4 large scale GP40WH locomotives built for MARC. 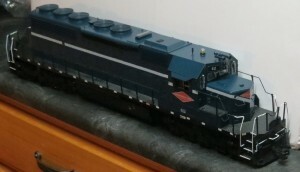 These are 4 axle diesels that resemble a SD45 rear with a wide cab. The picture on the left shows a Vermont Railway GP40 with a wide cab. The locomotive was purchased from the Canadian National as almost all CN locomotives have wide safety cabs. The above car was painted for large Scale On Line while East Board Top Style M1 motor car was built for a NY modeler.